Who has never had acne? I think everyone who’s gone through puberty and adolescence know how it feels to have pimples. Some of us never outgrow it. No matter how good we take care of our face, there are unlucky ones who will always grow a pimple or two near their monthly period. Pimples were never really a big deal for me. I got them, but they went away too. Maybe I have a pockmark or two from a couple of nasty ones, but the biggest scar on my face wasn’t from a zit – it was from when I had chicken pox at 13. Now, while I try to recover from a herniated disc, have cough and colds, and a super stye that has finally drained out, I have acne problems to boot. And these are no ordinary acne. Do you know how annoyingly painful huge zits are? How they seem to have a life of their own? How you are constantly aware of their presence, and there’s a tad of nagging pain all the time? Imagine five of those. On your scalp. Ugh. I have scalp breakout. For the first time ever. And there’s so many of them I can’t help but complain. One is even in a position that makes it hard to lie on my back. So naturally, I Googled scalp breakouts to find out if this could be a symptom of something worse. Good news is, it doesn’t seem to be the case. Though there is no conclusive data, it seems stress-related. It could also mean that I have oily scalp (which is funny because I actually thought I had dry scalp because it’s also been flaking). How to treat it? Some say laying off dairy products would help; not trying that because I don’t feel like I’ve had more dairy lately. Others suggest tea tree oil. I trust that suggestion, but our Body Shop small bottle of tea tree oil has run out already. I apply sunflower oil instead, from the Human Nature line. It seems to have helped. I don’t think it’s necessary to get any special shampoo. I just need to keep my head and hair clean. And endure the pain. Some of them are drying out already thankfully. Based on what I’ve read, some people get it on and off for years. Hopefully this is a one-time thing for me. Please oh please. So I wonder, why are all these health issues coming out all at the same time? But rather than spend time pondering that, I guess I should just be glad they are all happening now that I am on LOA, rather than one at a time. I just wish they’d all go away already, so I can start being more productive during this much needed time off. Productive as opposed to eating, sleeping, and watching TV. The only time I am out of the house is for therapy. But no room for self pity here, I say, scalp acne be gone! *Text and photos for this post are from the Human Nature Facebook page. I can personally attest to the Elemi wash, Purifying Facial Scrub, Moisturizing Night Cream and the Sunflower Beauty Oil because I use all of those. Once I finish my current tube of BB cream, I’ll be switching over to the Day Fluid and get either the face powder or the foundation from the mineral make up line for coverage. Will also switch to the Balancing Toner once my big bottle from Forever Flawless is all used up. 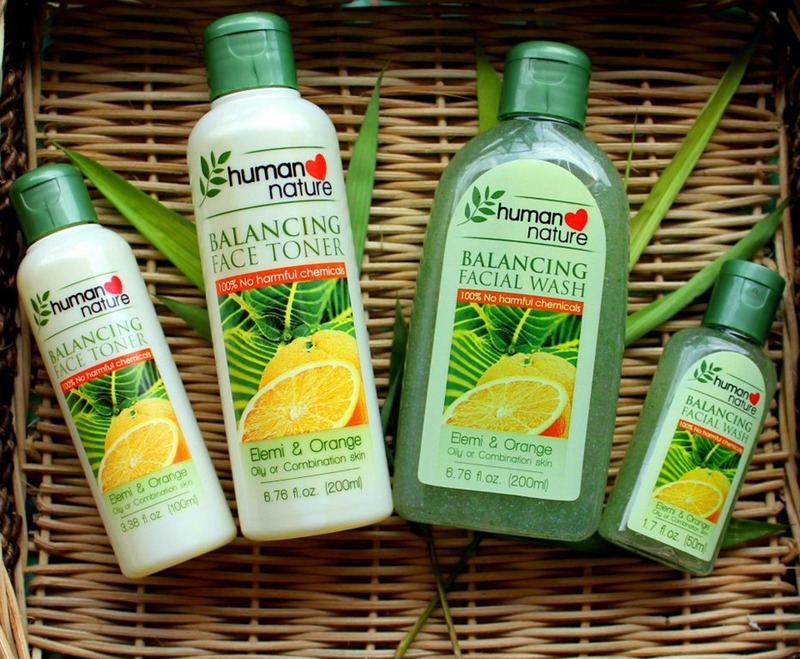 Let’s go natural and organic, let’s patronize Filipino products, Let’s go Human Nature! 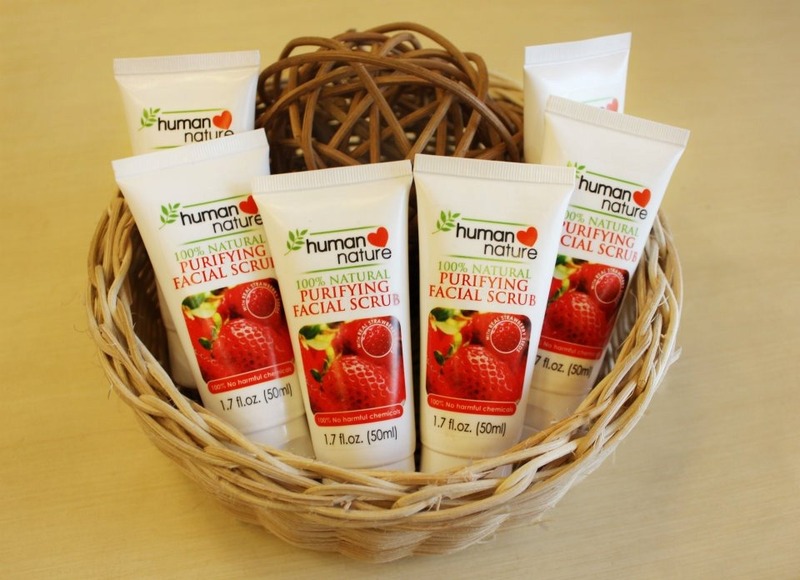 Leave a comment with your contact details if you wish to order directly from me, or click on the image of my 10% off voucher that I’ll be posting at the bottom of the post to order directly from the Human Nature website. Every day, our skin is assaulted by dirt, grime, pollutants, and toxins. This means that a daily skin care regimen is important to keep your skin clean, nourished, and glowing with health. But first, it’s also important to know which products will suit your skin and bring out your natural glow. 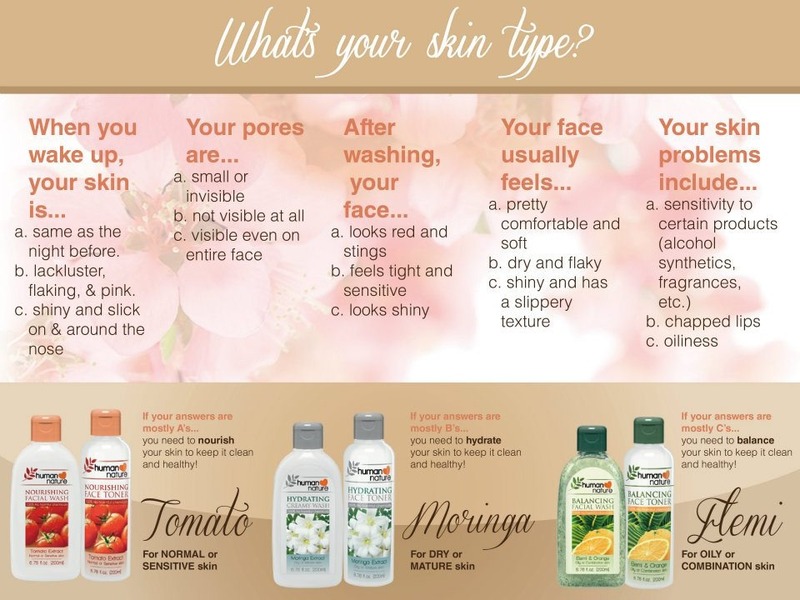 Not sure what your skin type is? Take our mini quiz to help you figure out your skin type so you can get the line that will bring out your skin’s beauty best! Once you’ve determined your skin type, click on to the next photo to learn more about the face care line that best suits your skin. 1. CLEANSE: Purify your skin by removing dirt, oil, and excess make-up accumulated throughout the day. Alternate the Nourishing, Balancing or Hydrating Facial Wash with the Purifying Facial Scrub twice to thrice a week to gently exfoliate your skin and reveal smoother complexion. 2. TONE: Toning removes deep seated dirt that may have been left behind by the wash. Plus, it primes your skin for easy absorption of moisturizer. Use the appropriate toner for your skin type: Nourishing, Balancing, or Hydrating. 3. 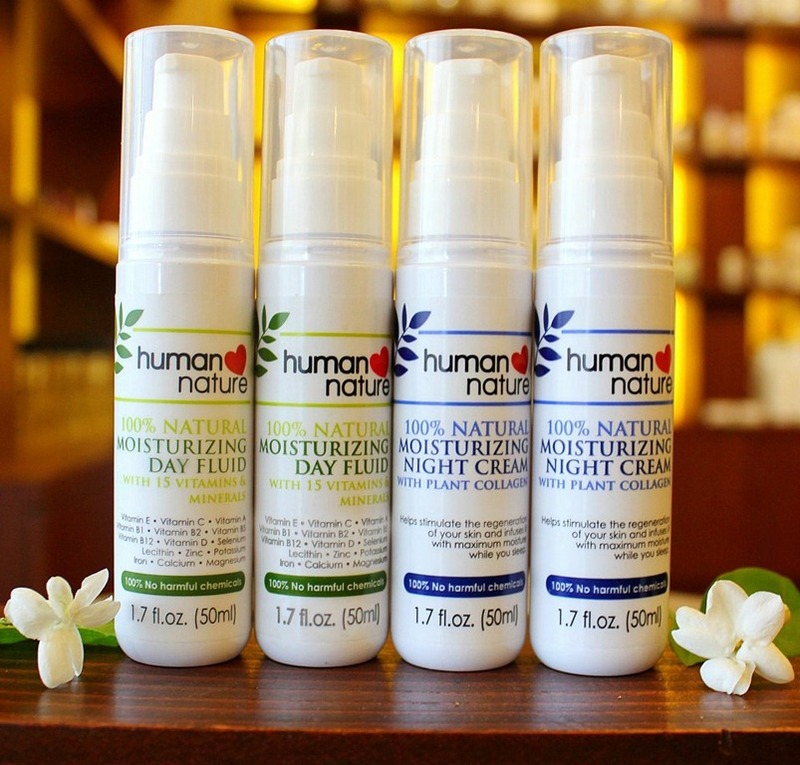 MOISTURIZE: Moisturize your face with 100% Natural Moisturizing Day Fluid before applying make-up. This helps your make-up last longer and blend well with your skin. Before going to bed, apply 100% Natural Moisturizing Night Cream to help the skin increase its ability to regenerate newer cells and replenish moisture. 4. 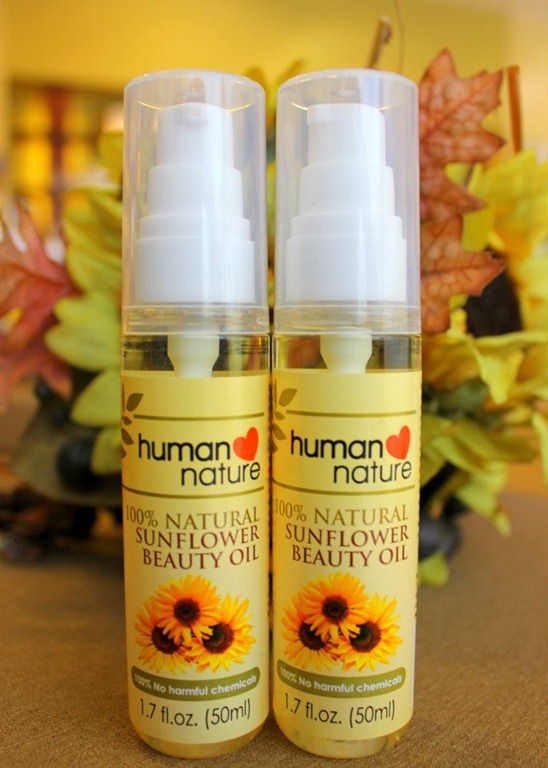 MIRACLE CARE: Apply a few drops of our 100% Natural Sunflower Beauty Oil to areas that need special care and attention, such as under eyes, uneven skin tone or pigmented spots. So what are you waiting for? Take care of your skin, take care of yourself. Clear skin can sure boost confidence. Here’s a discount coupon for 10% for your first purchase! Image owned by Human Nature. I am personally using the Balancing Facial Wash and love it. 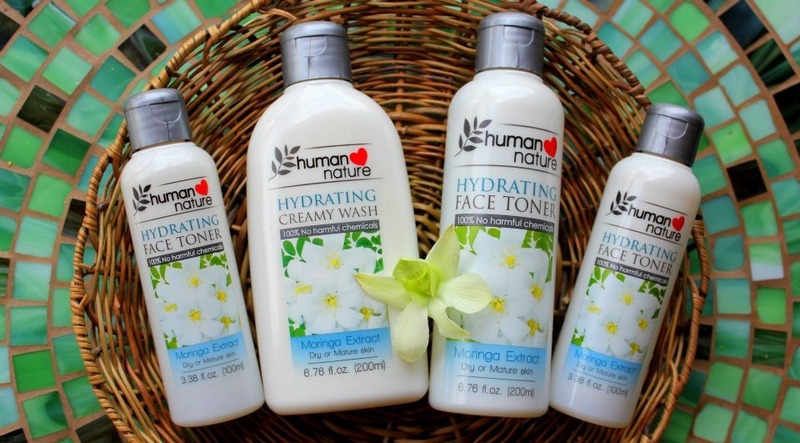 The Hydrating Facial Wash is specially formulated for dry or mature skin. The combination of moringa and aloe vera gives your skin a nutrient boost, at the same time soothes, heals and moisturizes. I have a small bottle of the Juicy Burst Sanitizer in my bag at all times. I prefer it over the usual gel sanitizers. It smells clean and is multi-purpose too. I even use it to spritz the seat on public toilets, or to just give the room a clean smell. Although I still have a lot of juice in my spritzer, I went ahead and bought the 200mL bottle so I will always have refill available in case I run out. That’s how much I love it! 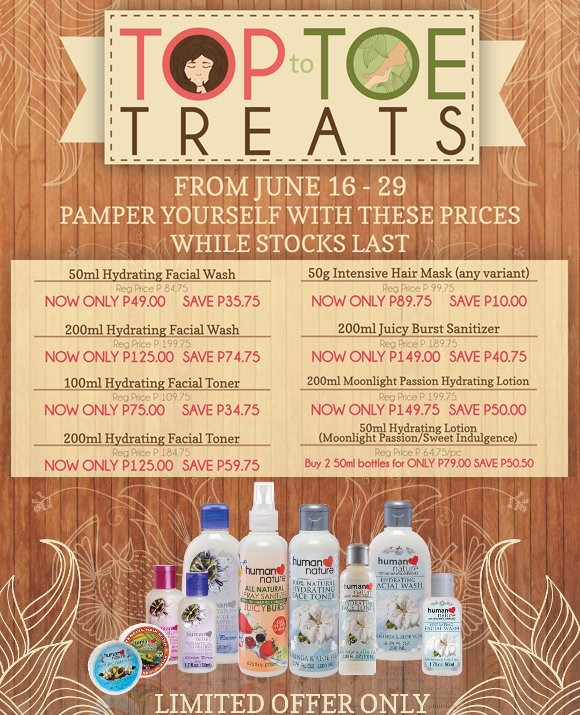 Now, get a Mega Moisture Blowout from head to toe by taking advantage of the great deals on the Hair Masks, and the Hydrating Lotion. The hair mask has organic virgin coconut oil and with regular use, is a good substitute to getting hot oil or rebonding treatments. The Hydrating Lotion uses passion fruit seed oil, sunflower seed oil, and avocado oil. 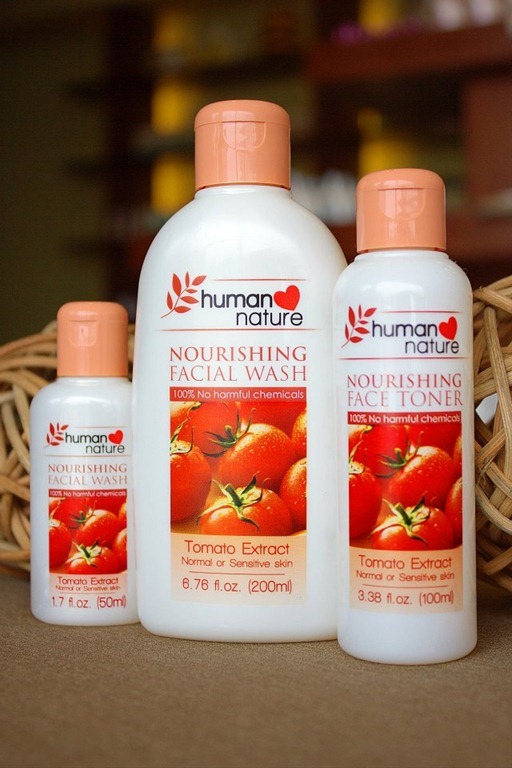 You may order online via the Human Nature website, or you may get in touch with me directly for your orders. So long after first hearing about Jujucleanse, we are finally doing the Juju! I’m on my 3rd bottle now, the Red Giant. I was hungry just in time for this one, but I took in a wee bit of bread. Earlier, it wasn’t so much as being hungry, but wanting to put something in my mouth. So like I said, this is my 3rd bottle for the day, and there are three more to complete the Level 1 (1-day) cleanse. The Green Bomb (1) tasted a lot like celery stalks, but it wasn’t so difficult to drink it up. The Spicy Limonada (2) was a little harder for me to finish. It was a tad too spicy for my tastes. It has cayenne pepper as an ingredient. This third one, has beets, pineapple, carrots and ginger. I had expected it to be sweet, but the ginger triumphs over the other tastes. Finish it I will. It’s recommended to drink lots of water too, and I need no more encouragement than the punishing heat. I am definitely drinking a lot of liquids today. I am really hoping this cleanse boosts my metabolism, and jumpstarts my body to a healthier journey. Of course it matters what I put into it after cleansing. Mom and I took advantage of the 10% discount offered by JujuCleanse. Promo ended the other day. It was easy to order, the fastest way is by texting them at 09175763012. 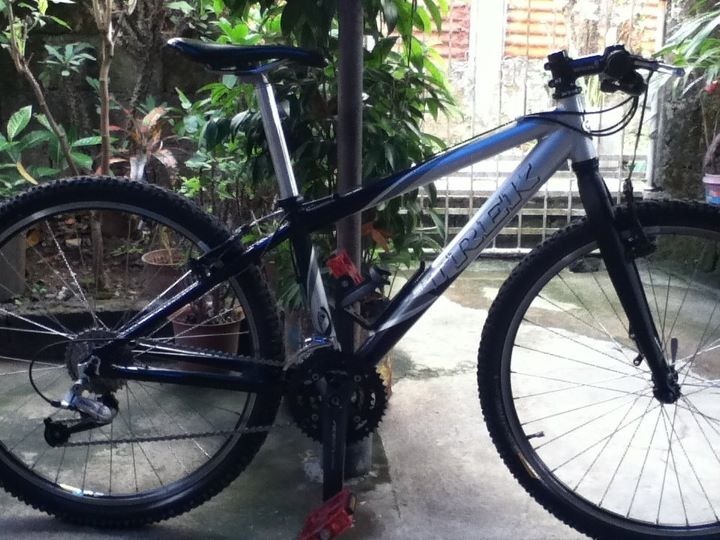 It’s a second-hand bike he got for about 7000 pesos. He intends this to be Diane’s bike, as soon as he finds another one for himself. Alfred and I are looking to get bikes too. Kuya’s friends go on bike trips already and someday maybe we can join them. For starters, we’ll bike around the area or around UP. Oh scratch that, for starters, we need to get bikes. It’s been decades since I was last on a bike, but I rode my bike everyday when I was a kid. If I ever do get into serious biking, I wonder if I’d want those biker suits too? You know how I’d always go in the Nike store because I love their fitness wear for women, and how I admire looking at yoga apparel because they look so comfy for when your exercising. Would I feel the same about getting those figure hugging outfits that bikers use? Maybe not. Haha. Maybe our friend Ruth is right (she’s gone biking with her husband too), I should make the investment for health. But these bikes are just so darn expensive. We saw bikes on sale at Greenhills last week but I don’t know if that will do. Maybe I’ll borrow this bike first and try it out.